POSTED August 24, 2018 3:57 p.m. It doesn’t happen often, in fact only four times in the past 30 years. Make that five. The Golden Eagles defense limited the Flying Arrows to just 220 yards of total offense and authored goal line stand late in the third quarter to preserve the shut out. 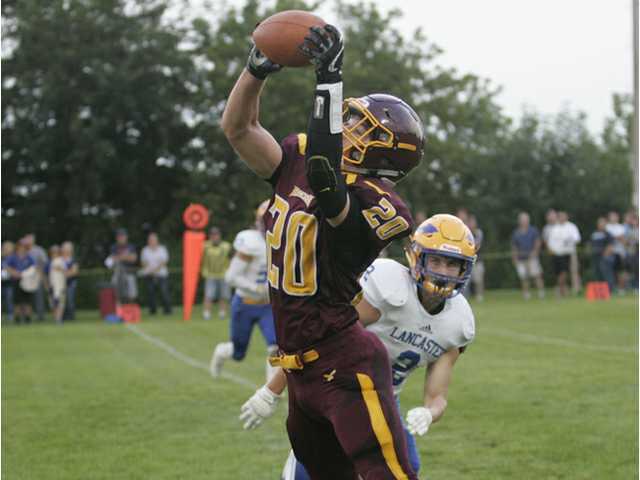 The Fennimore offense finally got on track, scoring a pair of fourth-quarter touchdowns making Jonah Roth a winner in his head coaching debut. “We know Lancaster has a great rushing attack and our focus all week was getting as many players to football as possible,” said Roth. “We also focused on doing your ‘own job’ and trusting in the team concept. The first half was a grim defensive battle with each offense struggling to find a rhythm. The Flying Arrows managed just 84 yards rushing in the first two quarters against Fennimore’s veteran defensive unit that returns seven starters from a year ago, but 57 came on one run by sophomore quarterback Hayden Knapp. The Lancaster defense was equal to the task early on and held Fennimore to 80 yards of total offense, including just seven yards rushing on 13 carries in the opening 24 minutes. Coach John Hoch’s Arrows finally came alive offensively on the first possession of the second half, putting together an 18-play, 72 yards drive the chewed up nearly 10 minutes of game time. But the Fennimore defense rose to the challenge and stuffed junior fullback Corey Hahn at the 1-yard line on fourth-and-goal. Lancaster was 0-for-8 on fourth down in the game. Senior quarterback Reid Larson and Fennimore offense went to work and put together a length of the field drive to break the deadlock. Larson found junior Kellen Kenney for a 20-yard gain on first down, then hit fellow senior Maguire Fitzgerald over the middle for a 19-yard TD strike to cap the 13-play, 99-yard drive and give the Eagles a 6–0 lead with 8:51 left in the game. Fennimore stopped Lancaster on downs again on the next possession, and Larson turned a broken play into a 16-yard touchdown scramble with 3:05 remaining. Larson then hit Kenney for the two-point conversion to complete the scoring. Larson finished 13 for 17 for 186 yards. Fitzgerald was his favorite target with seven catches for 75 yards. Kenney finished with a five catches for a team-high 85 yards. Senior Zach Davis rushed for 43 yards on 12 carries. Junior linebacker Will Ahnen finished with 10 tackles to lead the Fennimore defense. Senior lineman Kevin Griswold and Noah James, and junior Ethan Koestler were each in on eight stops for the victorious Eagles. Knapp finished with 91 yards on 13 carries, and completed 4 of 11 passes for 55 yards to lead Lancaster. Hahn rushed for 52 yards on 21 carries. Lancaster was last shutout in the third game of the 2015 season by Arcada, 56–0. Before that, the Arrows last shutout loss, was a 24–0 setback in a 2008 WIAA Division 5 Level 3 at Cedar Grove–Belgium. Lancaster’s only other shutout losses in the past 30 years were a 13–0 loss at Cuba City in the opening game of the 2007 season and a 19–0 loss to Brodhead/Juda in the 2003 season opener. NEXT: Fennimore (1–0) will host Richland Center (0–1) Friday at 7 p.m. The Hornets are coming off a 42–7 loss at Wisconsin Dells last Thursday. First downs — F 13, L 7. Rushing — L: 36-152, F 24-36. Passing (comp-att-int, yds) — L: 4-11-0 68, F 13-17-0, 186. Fumbles–lost — L 2-0, F 0-0. Penalties-yards — L 4-24, F 10-51. Rushing — L: Hayden Knapp 13-91, F: Zach Davis 12-43. Passing — L: Knapp 4-11-0, 68; F: Reid Larson 13-17-0, 186. Receiving — L: Preston Nothe 1-41; F: Maguire Fitzgerald 7-75; Kellen Kenney 5-85.